Boris & Nina invites to serious playfulness, humble co-creation and pure presence. With a warm hearted pedagogy they make everyone feel included and rise to their own potential. Thanks to their common interest in movement and creativity with a life affirming attitude they found each other. Ever since they teach and perform together around the globe inspired by their different backgrounds of yoga, dance, circus, street performing and kung fu. 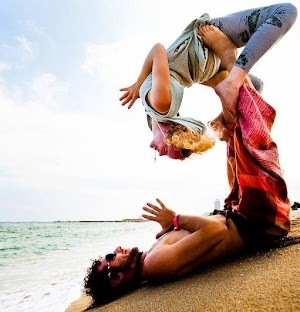 On that path they found AcroYoga and studiedwith the co-founders Jason Nemer and Jenny Sauer-Klein. Both Nina and Boris are certified AcroYoga teachers passionated about sharing the bliss of AcroYoga wherever they go.